It might have been one of the most famous and infamous lines ever used in a closing argument by a defense attorney … If the glove does not fit, then you must acquit”. Those were the words uttered by defense attorney Johnnie Cochran that became the enduring memorable moment of the OJ Simpson murder trial and his acquittal. However, 17 years later, OJ Simpson is serving time in prison on a separate charge and famed defense attorney Johnnie Cochran since deceased, former LA County prosecutor Chistopher Darden is making the claim that Cochran tampered with evidence, namely the bloody glove. Cochran died of a brain tumor in March 2005. Seventeen years after the sensational murder trial of O.J. Simpson, the former prosecutor who went up against the ex-football star’s legal “dream team” is now accusing famed defense attorney Johnnie Cochran of evidence tampering. Christopher Darden was a 15-year veteran of the Los Angeles County District Attorney’s office when he asked Simpson to try on the once blood-soaked gloves that prosecutors said Simpson wore during the June 1994 brutal murders of his ex-wife Nicole Brown and her friend Ronald Goldman. In what became the defining moment in the internationally publicized criminal “trial of the century,” Cochran, the head of Simpson’s defense team, said of the glove, “If it doesn’t fit, you must acquit.” In court proceedings televised around the world, Simpson struggled to get the glove onto his hand. The jury wasn’t convinced, and Simpson was eventually acquitted of the murder charges. 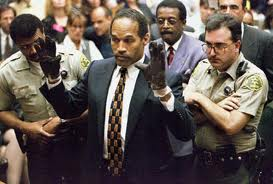 Darden accused Cochran of tearing the lining of the glove so that O.J.’s fingers couldn’t go all the way up into the glove. Former Simpson ‘Dream Team’ defense attorney Alan Dershowitz fired back and said that Darden should put up, shut up or be disbarred. Another one of Simpson’s legal team said that the comments were slanderous. Can you slander a dead man? “If he had the complaint, he should have made it in front of the judge,” Dershowitz said. “Now 17 years later he makes a serious allegation against a dead lawyer. Law School Professor Alan Dershowitz Says George Zimmerman Special Prosecutor Angela Corey Should Be Disbarred & Her Conduct Bordered on Criminal Conduct.